Most people spend much of their time indoors — either at work or at home — and wherever they are, they want to know the air they’re breathing is healthy. Poor indoor air quality can lead to sore throats, eye irritation, runny noses, rashes, headaches, bad smells, and other issues. Customers won’t want to visit your store if it triggers their allergy or asthma symptoms. Increased health problems from low indoor air quality can also reduce employee productivity. Here are four useful ways to improve the indoor air quality at your Tampa, Florida, company. Dusting and vacuuming often will help keep dirt, dust, pollen, and other contaminants out of your business’s ductwork and air filters, minimizing allergy triggers and improving air quality. A bonus to cleaning more frequently is you won’t have to change your air filters or have your ducts cleaned as often, reducing expenses. A cleaner business is simply more attractive to customers, but be careful which products you use to clean. Avoid using cleaning supplies and air fresheners that contain volatile organic compounds like benzene, xylene, and acetone, as they can cause health issues like dizziness and fatigue. Instead of commercial cleaners, use natural solutions, like water and baking soda and even vegetable oil with lemon juice as a furniture polish. Using essential oils instead of traditional air fresheners can give your place of business a great smell without the side effects of harmful chemicals. You may even attract additional customers by letting them know that your company uses all-natural cleaners and other products. UV air purifiers use ultraviolet light to damage the genetic structures of microorganisms and keep them from reproducing. Some systems attach a coil sterilization light to your HVAC system’s air handler; others install an air sterilization light in your ductwork. A UV air purifier can keep illnesses from spreading, and they can even eliminate biological growth and the odors associated with them. In fact, some purifiers can reportedly eliminate 99 percent of airborne bacteria and viruses, including the flu, MRSA, strep, and the common cold. Many hospitals rely on them, and they’re also ideal for large offices. When your air is healthier, so are your employees. That means employees take fewer sick days and spend more time on the job. Adequate ventilation can remove the airborne smells, pollutants, and humidity that come from cooking, manufacturing, or other tasks. With an energy recovery ventilator (ERV), you can avoid wasting energy that results from keeping your doors or windows open or using exhaust fans. ERVs work like heat pumps to transfer heat and make the fresh air coming into your business warmer or cooler. There are several benefits to installing ERVs. Not only can they filter incoming outdoor air as they remove stale indoor air, but they can also help you save energy, lower your utility bills, and extend your HVAC system’s life. Regular preventive maintenance can help you keep your repair expenses low, extend your system’s life, and ensure employees and customers are comfortable. Having your business’s HVAC system checked by a professional at least twice annually can help avoid costly, inconvenient breakdowns. During these services, the technician can check your ductwork and insulation for air leaks and contaminants and change your system’s air filter. Do your part to keep indoor air quality high by keeping debris away from your outdoor unit and trimming nearby vegetation to improve airflow and efficiency. If your employees and customers are sneezing more frequently in your business, you’re noticing strange smells, or you’re noticing drafts, consider contacting an HVAC expert to identify and resolve the problem. 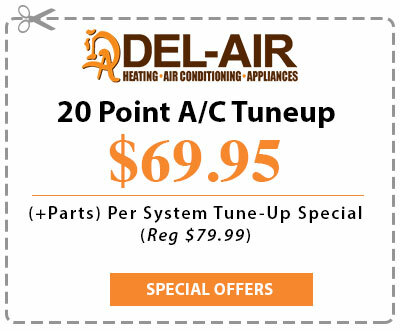 Del-Air Heating & Air Conditioning has the solutions you need for improving your indoor air quality. Call us anytime at 844-574-4578 with questions about your HVAC equipment or when you’re ready for a professional to install or maintain your business’s heating and cooling equipment. We’ll give you the help you need to keep your business booming.